Organizations and businesses interested in participating in the Frolic Parade should download an entry form below and return it via mail. No entries will be accepted after Wednesday, June 5. For parade questions, please email parade@mthorebsummerfrolic.com. The annual Frolic Parade is a celebration of community. Village residents and their guests line the streets as entries representing local organizations and businesses pass through downtown Mount Horeb on their way to the Frolic grounds. The parade begins Sunday at noon. 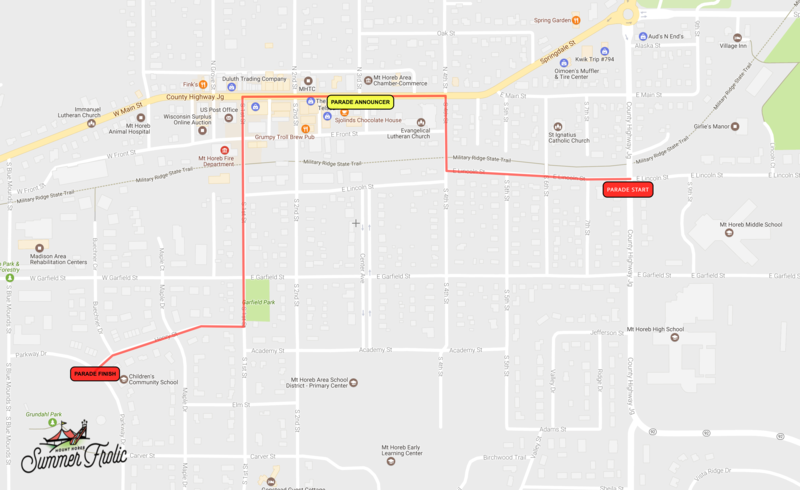 The route opens at Mount Horeb Middle School, proceeding west on Lincoln Street, continuing north onto Fourth Street and west onto Main Street. The caravan then heads south on First Street and turns right onto Henry Street, ending at the Frolic grounds. An announcer describes the various parade entries from the 300 block of East Main Street, and provides tidbits of Frolic history. No parade entrants may engage in any illegal or offensive behavior that threatens the safety and/or livelihood of parade participants and spectators. All participants must demonstrate good common sense and act in the best interest of the community and the event. Failure to do so will result in immediate removal from the parade, and a ban on future parade participation.